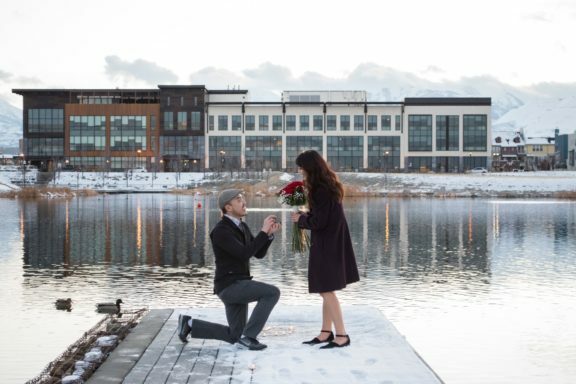 Proposal Ideas - Shane Co.
It’s no surprise that one of our favorite things is a customer proposal. 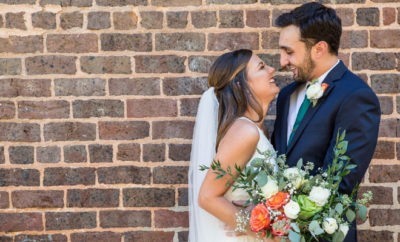 Whether they’re over the top or sweet and intimate, we’re a fan of them all! 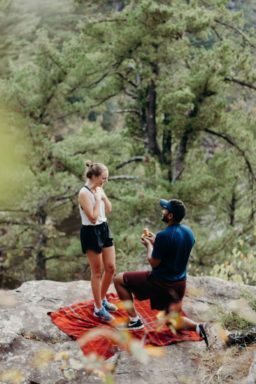 We’ve rounded up just a few of our favorites to pass along a little proposal inspiration for anyone who may be thinking about popping the question. Congratulations to all of these Shane Co. couples! 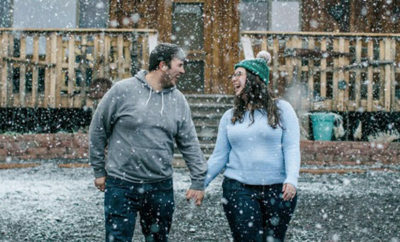 “Glad I get to spend the rest of my life with this beautiful woman.” – Zack F.
“My fiancé proposed at the same place as our first date, where he asked me to be his girlfriend, and where we said ‘I love you’ to each other. In just a few weeks, we’re moving into our home we built together in that same location!” – Trammie N.
“SHE SAID YES! On our five-year-and-one-day anniversary of our first date to the Indiana State Fair, I asked Kennedy to be my wife at the top of the Ferris wheel. 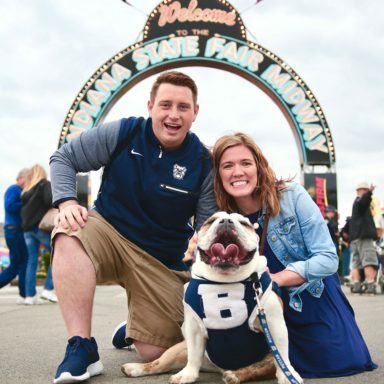 I can’t wait to start the rest of my life with you, Ken!” – Evan K.
“It was an oddly warm Saturday in September. My now-fiancé and I had a hike planned at Taylor’s Falls. We love to be active and enjoy nature, so this day was nothing out of the ordinary (or so I thought). We walked and talked and enjoyed the beautiful day until we came to a clearing where we could see across the river. Taji wandered a short distance over to a large rock where we could have a better view and told me to come and see. As I was admiring the landscape, he had laid out a blanket and was in the process of getting down on one knee. When I turned around and realized what was happening, I was in COMPLETE shock. I started crying tears of pure joy and total surprise, as I had absolutely no idea that it was coming. After the proposal, Taji drove me to a park where about 40 of our closest friends were waiting to celebrate with us. 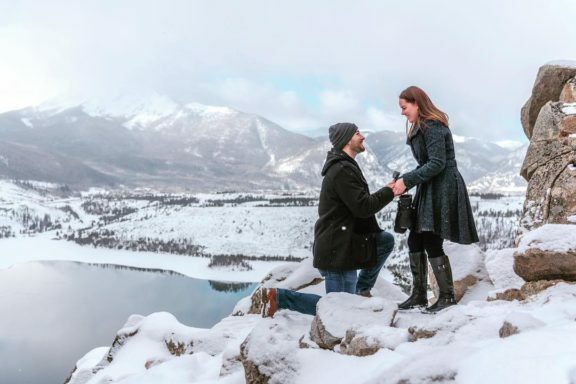 I could not imagine a better proposal, and I’m so glad he had photographers there to catch the special moment so we can always relive the excitement from that day!” – Kendra J. 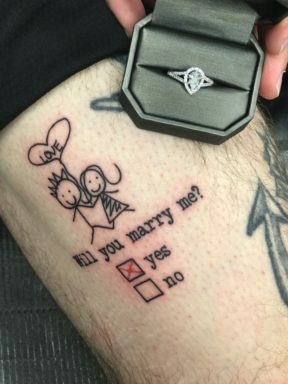 “Vinny surprised me with a tattoo proposal. He is a tattoo artist and took me to the shop that day and said I was going to tattoo him for my first time ever! He pulled up his pant leg and this is what I was going to tattoo! I was so surprised. I’m in love with my pear-shaped ring!” – Brooke W.